One of Aaron Spelling's biggest hits, the original Fantasy Island was introduced to viewers via two made-for-TV Pilot Movies in 1977. Those went on to spawn a highly popular series that ran on ABC from 1978 to 1984. Ricardo Montalban starred as Mr. Roarke, the mysterious, charming, white-suited figure who ran the eponymous island. Assisting Mr. Roarke was his earnest, vertically (and verbally) challenged sidekick, Tattoo (played by Herve Villechaize, also famous for playing Nick Nack), who kicked off every episode by running up to the island's bell tower, ringing the bell and loudly exclaiming "Da plane! Da plane!" The plane he was talking about, of course, was the one that was delivering new arrivals to the island, each of whom had lain down a sizable sum of money to have his or her personal fantasies fulfilled. Mr. Roarke would take it upon himself to greet every guest as they stepped onto the island and then describe to Tattoo in an As You Know fashion, the nature of their fantasy request. Of course, being a supernaturally-powered Trickster Mentor, Mr. Roarke very rarely allowed his guests' fantasies to play out in the way they expected them to. And quite often the fantasies themselves were used to teach each guest an important moral — one intended to open their eyes to some facet of their own lives they might have been neglecting. Or to teach them to appreciate what they have. Or just simply, to Be Careful What You Wish For. But rather often, everybody just had a good time, even if it wasn't what they were expecting. 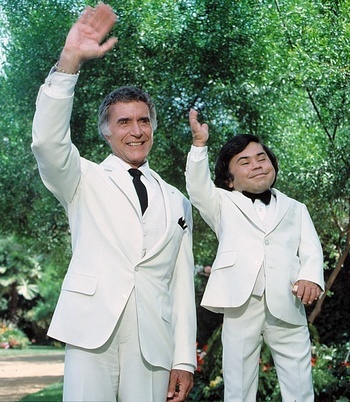 In 1998, ABC hosted a Fantasy Island revival series that put Malcolm McDowell into the role of Mr. Roarke. McDowell's take on the character was a bit darker, as was the tone of the series. Gone were Tattoo and his antics. Instead, Mr. Roarke had a team of assistants, most of whom were compelled to serve on the island as a form of metaphysical punishment for their past sins. One of the assistants was a beautiful shape-shifting woman named Ariel (a Shout-Out to a character of the same name in The Tempest.) She was Mr. Roarke's right-hand woman and a source for much of the series' Fanservice. Mr. Roarke also employed an elderly couple as travel agents, who would book the fantasies at the beginning of each show. As mentioned before, McDowell's take on the Mr. Roarke character was a bit on the dark side, and he seemed to take more delight in watching the guests squirm under his treatment, but he was basically a decent fellow/omnipotent Trickster Being, and most guests came away better for their experiences. Of course, it was canceled after only half a season. Absent-Minded Professor: In "The Inventor", an AMP and his lab assistant (Artie Johnson and Marsha Wallace) arrive on the island to perfect a formula .... which has already blown up eight separate labs. Actor Allusion: Mr. Rourke is named after Montalban's most famous American film role, Jose O'Rourke in Neptunes Daughter. An Aesop: The guests typically get one apiece. Aloha, Hawaii! : One episode of The Love Boat had a Hawaii-themed episode take place here. Not surprising, since the two shows aired during the same time block. As Himself: Tattoo arranges for Don Ho to sing at Mr Roarke's wedding, and a sixth season episode finds Mickey Gilley playing himself pre fame looking for stardom and getting his real life club Gilley's. Be Careful What You Wish For: Employed many times throughout the series. Bland-Name Product: An actress lists among her credits a movie called ''The Towering Disaster''. The Boxing Episode: In an episode entitled "The Boxer" a boxer (Ben Murphy) arrives on Fantasy Island to clobber an opponant who beat him in the past. "Smiles, everyone! Smiles!" "The plane, the plane!" Dunkin' Donuts once had a commercial where Tattoo runs into a donut shop and exclaims "The plain, the plain! Nonono, the chocolate, the chocolate! Nonono, the Boston cream..."
Crossover: Apparently among Mr Roark's magical, mystical abilities is the power to Cross Over with other Aaron Spelling series . Evil Twin: In "Look Alikes", a guest (Ken Berry) wishes to meet his non-related twin (Ken Berry). Fanservice: Lots and lots of hot guys and pretty girls, all in swimwear/skimpy clothing. Also, Mr. Roarke had a couple of Shirtless Scenes. Believe it or not, Ricardo Montalban was seriously built in Real Life. Remember Star Trek II: The Wrath of Khan? Yeah. That was allll him, baby! Fish out of Temporal Water: Many guests are sent back in time — and sometimes figures such as King Arthur, Don Juan and Jack the Ripper ended up in the 70s. "Freaky Friday" Flip: One episode finds a bickering couple (Vic Tayback and Katherine Helmond) swapping bodies for the weekend. Functional Magic: After a few episodes that tried to play the fantasies straight as elaborate set-pieces and full-immersion games run somewhere on the island, the writers just gave up and made everything magical. Gender Bender: In 1998's "Estrogen"
Gender Flip: Also in "Estrogen"
Guile Hero: Mr. Roarke, and how. Hand Wave: The explanation for just about anything that Roarke does. I Just Want To Be X: See "Wish Fulfillment" trope for the complete list, but each one of these at one point or another formed the basis of a story. Kids Shouldn't Watch Horror Films: In "Instant Fastasy", Two kids were watching a horror movie on TV while Laurie left for the beach. Lady Killer In Love: While there were a few female guests on the island who would flirt with Rourke (who would only respond with a polite smile whilst ignoring their advances), it becomes a massive surprise when in "The Strongest Man Alive", he falls in love with a widowed guest for real. Whenever he's not dealing with the other guests, he spends all his free time with her, and bonding with the lady's son. They even go as far as wanting to remain together, but all falls apart when her humanitarian work in India forces her to leave the island. Rourke spends the final moments of the episode angsting over her departure. Later Installment Weirdness: In early seasons it was just about people fulfilling their fantasies, albeit with some Fridge Logic about how Mr. Rourke managed to pull some of it off. By the final season the show was dropping some pretty heavy hints that Rourke was an actual angel of the Lord. Limited Wardrobe: In the original series, Mr. Roarke never deviated from his white suit, nor did Tattoo when he was on duty. The revival series tried to distance itself from its predecessor and emphasize its Darker and Edgier nature by putting Mr. Roarke in a black suit. He also orders all his white suits burned. Man in White: Mr Roarke's wardrobe in the original, subverted in the Remake (See Limited Wardrobe above). Mr. Exposition: Mr Roarke, explaining the guests' backstories to Tattoo. Mysterious Past: Rourke's full past was never revealed, but we know he's several centuries old, counts Camelot's Merlin as 'a dear old friend', that he can be killed if he willingly suspends his powers, and that The Devil wants his soul very badly. Fan theories are that he's either an angel or a man granted powers by a God to help people by granting their wishes. Our Mermaids Are Different: Michelle Phillips as Mermaid Princess Naya in three separate episodes. Recognition Failure: One episode featured a fictional starlet who had the fantasy of being somewhere where nobody knew who she was. She was sent to the wilds of [Africa/South America], where she fell in love with an explorer who didn't know who she was. Subverted though in that it turns out he did know, he just didn't care about her celebrity. Recycled In Space: The Love Boat ON A MYSTERIOUS ISLAND WHERE WISHES COME TRUE! Secret Test of Character: This is what most of the Fantasies granted actually were; the customers learned an important lesson whether they wanted it or not. Shakespeare in Fiction: In the episode "Room and Bard" William Shakespeare (Robert Reed) is brought to the 70s to write a play for a horror film star wanting to become a serious actress. In one episode three secretaries want to be their favorite detectives - Charlie's Angels (Both shows were produced by Aaron Spelling). In the 1998 series, one guy's fantasy wife complained about him almost breaking her Ricardo Montalban plate. Sidekick: Tattoo in the early seasons. He was joined later on by Mr. Roarke's goddaughter, Julie, and later replaced by Lawrence the Butler. Spin-Off: For a few weeks ABC tried a Children's version of "Fantasy Island" aired in the 'Family Hour' of Sunday @ 7pm Est time slot. The only differences between it and the 'Saturday @ 10pm' version were that kids had requested the fantasies, and they arrived and departed via Hot Air balloon instead of De Plane. These episodes were syndicated with the parent show. Take That! : The pilot for the revival had two to the original show - first Mr. Roarke demanded his white suits be burnt on account of their "getting a little dated"; then when Cal shouted "The plane! The plane!" Mr. Roarke told him never to do that again. Time Travel: Often, guests would think it was a simulation, but learn they had traveled back in time for real. Sometimes they even found themselves taking over the role of a famous historical figure (which could be a real bad thing if that figure was, oh, say, Marie Antoinette or - for totally different reasons - Lady Godiva). Two Lines, No Waiting: The hour-long episodes followed the exploits of two separate Guests. Most of the time, the A Story and the B Story had nothing to do with one another; in fact, the two plot threads were usually written by two different scriptwriters (as was also the case with The Love Boat, except there it was three). During the Tattoo/Julie year we see Julie see the plane and run off to greet it. While some of the episodes with Tattoo give a short mention that Julie is busy with another fantasy, others show her leave to greet the plane, then disappear completely from that episode without explanation. We never find out why Julie and Tattoo leave before the Lawrence episodes. Wish Fulfillment and Wishing Tropes: Virtually every trope in these categories formed the basis of each of the stories seen on this show. Woobie of the Week: New guests are brought in every week to learn some sort of lesson.